Three runners for the team at Sale on Thursday following the good win of Mirimar at Sandown. Diva Peron is the first to go in race two, the Maiden Plate over 2240m with Andrew Mallyon to ride from barrier three. The daughter of Mastercraftsman made ground to finish third at her last start over 2050m at Murtoa and is up in trip. Mike Moroney had intending running last Sunday over 2000m however, the meeting was abandoned. 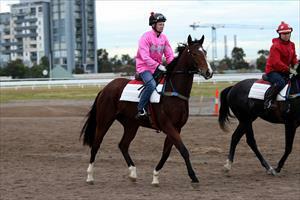 “She has ticked along nicely since missing out last Sunday and her work has been good,” Moroney said. Kariya (pictured) has her first start this preparation in race four, the Fillies & Mares Maiden Plate over 1422m with Patrick Moloney to ride. Unfortunately she has drawn one from the outside but Moroney is keen to get the daughter of All Too Hard started. “We’ve been pleased with her work leading into this race and her jump outs and she’s a stronger filly this time in,” Moroney said. "The draw is not ideal but we’ll ask Patrick to go forward on her as she has run her best on the speed. Prince Of Arran is in the last race, the Benchmark 64 Handicap over 1739m. Unfortunately, he too has drawn wide and will jump one from the outside in the field of 11 with James Winks to ride. “The draw is no help but he needs to run and we’ll ask James to ride the horse where he is comfortable,” Moroney said. “He gets a good track and will be better suited at this distance.